I grew up an Alabama fan. Auburn was yucky to me until my senior year of high school. I didn’t care for the colors or the team and never ever thought of going there until Brent did. I always thought I would go to Alabama or Montevallo. However, I didn’t want to be apart from Brent. Sounds silly, but we knew we wanted to get married so we didn’t see any reason going to different universities. My first 2 years at Auburn, I went to the football games but didn’t care for the cheers, the face paint, the fight song, the shakers, the shirts, the student section, the tailgating, etc. And I’m not lying when I say that I cried at the Iron Bowl my freshman year. You can ask Brent, Joe and Jennifer. They were all cheering at the first touchdown of the game and I stood there tearing up. The three of them turned and said to me in disbelief, “Are you crying? !” Yep. I was. I didn’t like the feeling of every single person surrounding me being excited that Alabama was losing. I took it as a personal offense to my family and what they had raised me to be…an Alabama fan. Until my senior year at Auburn, the Iron Bowl was always a wait and see game. I didn’t know who I was pulling for until I watched the game. The first 3 years, I naturally got excited when Alabama scored. I assumed that was proof that deep down I was still an Alabama fan. My senior year that changed. I pulled hard for Auburn and wanted to see Alabama lose. A lot of people see the rivalries solely based on colors, teams and coaches. I am different. I love Auburn because it is my “old stomping ground.” So many memories were made there. The closest friendships I have were started there. I have a degree from Auburn that I am proud of and I am even more proud to say that I am an Auburn alum. I don’t ever care to go back to school, but if I had the chance to get my master’s at Auburn, I would jump on it in a heartbeat. I just love Auburn that much. I feel that Auburn successfully and expertly prepared me for my field and I know my professors were commited and dedicated to their cause. Auburn is a small town and everyone loved and cared for the university. I loved the feeling on a Sunday afternoon after a big game, getting Toomer’s lemonade and walking around with toilet paper streaming from the trees. It was just a great experience, an Auburn experience. No one understands unless they have been a part of it. That is why I am an Auburn fan. Not because of the colors, the team, the coach, the eagle (even though that is a cool tradition). But because of what Auburn did for me. Having said all that and feeling very emotional right now…because I miss it so much…I have a secret to tell. I truly liked the fact that Alabama played well on Saturday against Georgia. I couldn’t help but smile when they scored. I know that I have really upset some of you but I don’t appologize. It is possible to like both sides of the biggest rival known to man in the South. I am living proof. 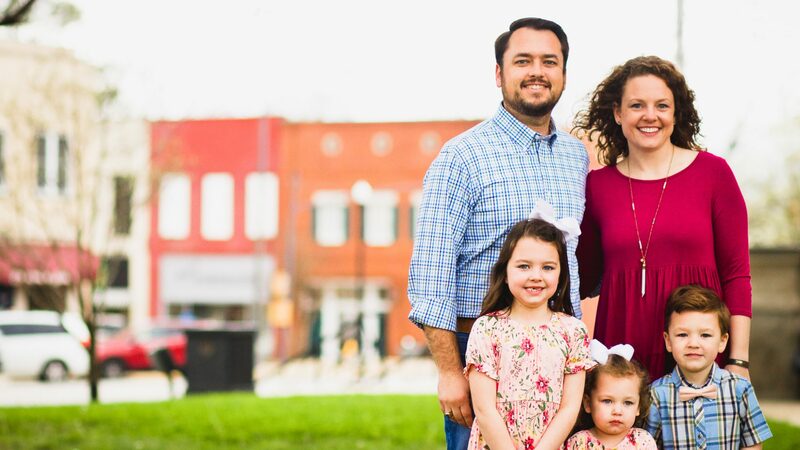 Alabama is what I was raised to be and I have deep roots with that team because it connects me to my childhood and my family. I also have deep roots with Auburn, just in a different aspect. I don’t think that it is 50/50. I do like Auburn slightly more than Alabama, just because I have more memories there and pride in the school and the traditions. And I can’t say who I will pull for during the Iron Bowl this year. You’ll just have to wait and see. 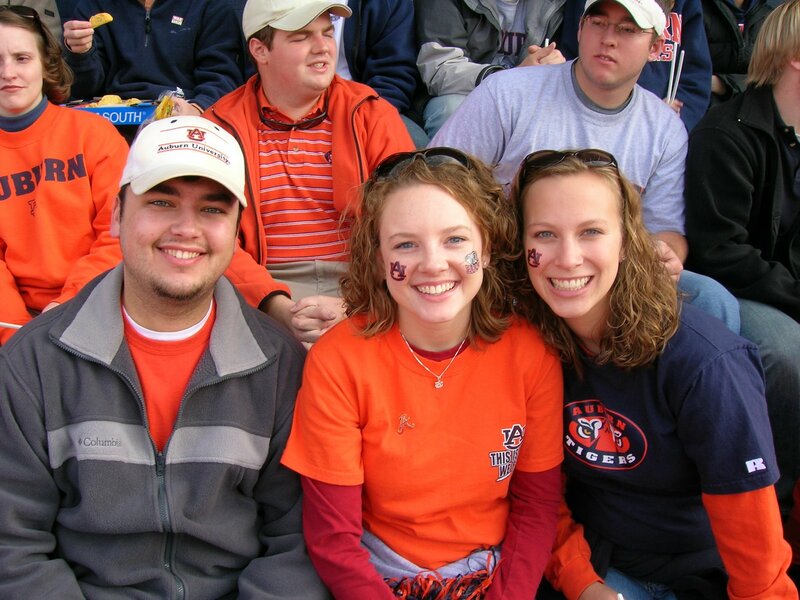 The picture is at the Iron Bowl 2005, my junior year. 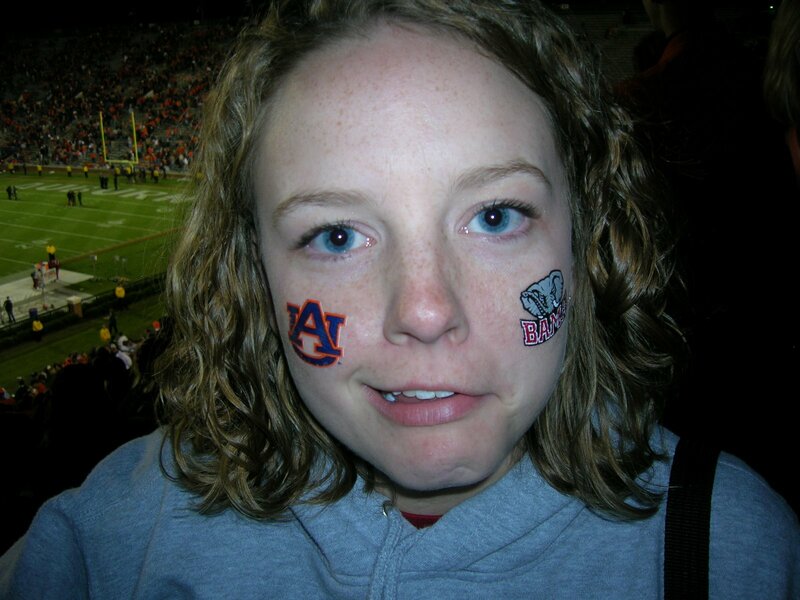 I am wearing an Alabama long sleeved t-shirt under an Auburn t-shirt, Auburn sweatshirt around my waist, Auburn necklace, Alabama pin, Alabama socks, Auburn face paint, Alabama face paint, Auburn shaker and Alabama shaker. Call me crazy if you want. I got some pretty funny looks. My house isn’t divided, my heart is. The only ones nice enough and brave enough to walk around with me looking like a confused idiot. This is me trying to make half of my face smile and the other half frown. I knew I liked you Brittany! My family is DIE hard AL fans! I love AL! We have a football party EVERY Saturday to watch the games. I love their rich history/traditions and I LOVE Coach Gene Stallings! When I was a kid (and you too) he was coaching there. I love that he is a Christian and that his teams were so disciplined. I understand you going to Auburn, but AL is always going to be special to you. Roll Tide! 🙂 I liked your story, it was so honest. That’s awesome!